Hi there! I'm Winged Mirage and I only found this forum a little while ago. Me and my sister found our old collections of My Little Ponies in the spare room, so we're both back into it now lol. I mostly have G1 and G2 ponies, with a few others that I've found at yard sales. I think I have about...30 ponies or so? I haven't counted them. I have gone and washed them all up recently. Nothing fancy, just some soap, Magic Eraser, and shampoo and conditioner. Did wonders. My main thing is writing fantasy and sci-fi. Most of it has been fanfiction, but I'm focusing more on original work now. I also love anime and videogames, especially RPGs. Welcome to the board! Nothing like finding your childhood ponies and rediscovering the love dat is Poniehs! What series are you writing fanfics for? I love sci fi, as do many here and I know we'd love to check out your writing! And I love anime and manga as well. It's all so much fun. Lol yeah. I don't have much of a budget so I can't go too crazy about it, but it feels good to hunt and find ponies at yardsales and thrift stores. Cleaning them up is pretty relaxing as well. I found a Fairy Tale bird a while back too, and an old Troll doll. I might put this in my signature too, so people can easily find it. Welcome welcome! It's a great group of pony people here. Nice to have you! I do love Ponies on da cheap. Sadly, my area is pretty poor pickings as far as Pony Acquisition. Best i can do is wander over to the county next to me and hope I find crumbs. I still buy the newest ones, but somehow finding the older gens is really what makes me happiest. But it doesn't have to be just Ponies for me either! I'll take a fakie, a cutsie wootsie little knockoff of any kind, be it bird, pup or kitten. I need lotsa adorable-ness-ness in my world. Otherwise it's all skulls, luchadores and death for me. I have sorta weird taste. Or so I'm told. I'll definitely try to try out some of your fanfics soon! I love reading people's stuff. I find it very interesting to 'meet' someone online then read their works. It's always so fascinating. I've had decent luck so far. Nothing super-rare, just some Gen 3 and 4 stuff. I need to post them in the finds forum sometime. I've bought some new stuff too, but I'm keeping that stuff in box for value purposes down the road. I myself like to have stuff out of box, but I understand why other people like stuff as mint as possible. Which reminds me, I need to stop by Target sometime and see if I can get some of those remake classic ponies. I seem to like a weird mix of creepy and cute things, sometimes mixed together. That's why I like Pokemon like Meowstic and Mimikyu so much, though Vulpix is still my favorite since she's my first ever favorite Pokemon. Aww, that'd be really nice if you read some of my fics. There's a lot to choose from, though none of MLP related. That cute and creepy thing...yeah, it applies to my writing too. Sometimes it's humor or fluff, and other times it's dark mindscrews, so...yeah, fair warning XD. Should be able ot tell them apart by the genres though. welcome I like creepy cute to. 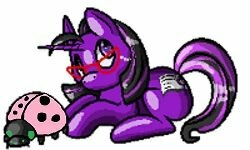 Most of my custom pony are creepy or glittery iono welcome to our herd. Thanks! I'm far from a pony expert, and I don't know how often I'll be on here, but everyone here seems really nice. Welcome! I got into collecting after pulling out my childhood toys too...that was over 15 years and probably 400 ponies ago! It's addicting! Welcome, so glad you joined. I think it is so nice you found your old ponies. That must have brought back some fun memories. Nice to meet you, Winged Mirage! As one fellow anime and RPG fan to another..what are some of your favs? Well it wasn't like I had no idea where my old ponies were. I just hadn't had them out for a while. It's nice to collect new ponies though. Gives me a little something extra to do and different places to visit.